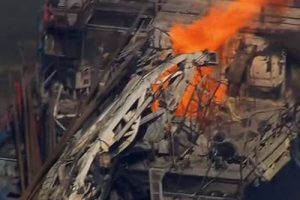 Washington, DC – Today the U.S. Chemical Safety Board (CSB) issued a safety alert entitled “CSB Safety Alert: Preventing High Temperature Hydrogen Attack (HTHA)” focused on preventing accidents similar to the fatal 2010 explosion and fire at the Tesoro Refinery in Anacortes, WA that fatally injured 7 workers. The CSB’s investigation into the catastrophic failure of a forty-year-old heat exchanger at the Tesoro Refinery determined that the fatal explosion and fire was caused by a damage mechanism known as high temperature hydrogen attack, or HTHA, which severely cracked and weakened the carbon steel heat exchanger over time, leading to a rupture. The CSB’s report released in May 2014 concluded that the standard industry uses for determining vulnerability of equipment to HTHA is inadequate. To address its findings, the CSB made recommendations intended to prevent HTHA to the industry group that issues guidance on HTHA, the American Petroleum Institute (API). Updated guidance covering this issue – recently published by API – provides incremental improvements, but it fails to address important elements of the CSB’s recommendations. The standard uses what are referred to as “Nelson Curves” to predict the operating conditions where HTHA can occur in different types of steels. The curves are based on process data voluntarily reported to API, and are drawn beneath reported occurrences of HTHA to indicate the “safe” and “unsafe” operating regions. API’s updated carbon steel Nelson Curves do not take into account all of the estimated process conditions where the catastrophic failure occurred due to HTHA at the Tesoro Anacortes Refinery. As a result, the new curves allow refinery equipment to operate at conditions where HTHA severely damaged the Tesoro heat exchanger. The use of a curve not incorporating significant failure data could result in future catastrophic equipment ruptures. Because of these noted deficiencies, the Board voted on July 13, 2016, to designate the Recommendation 2010-08-I-WA-R10 with the status of Closed – Unacceptable Action. The CSB’s “Status Change Summary” provides additional detail on the board’s rationale. 4. Use inherently safer materials, such as steels with higher chromium and molybdenum content. The Board does not issue citations or fines but does make safety recommendations to plants, industry organizations, labor groups, and regulatory agencies. Visit our website, www.csb.gov.